N A T O L I . nails . brows . 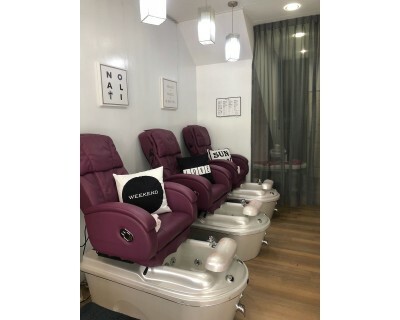 Enjoy a relaxing express mani - pedi on the go with our massage chairs . At NatOli, everyone is beautiful, we make you so. So go on, indulge, be bold, be beautiful. Visit our website to learn all about the amazing services we provide to all of our customers. Swing by our Nail Salon and treat yourself to one of our many VIP treatments! By Appointment only, subject to availability. Pls call 6455 7891 for appointment & mention Streetdeal. Voucher must be fully utilised by 30 Nov 2018. Not Valid on eve of Public holiday & Public holidays. Promotion is non transferable, non-refundable, not exchangable for cash or product. Printed voucher & NRIC must be presented upon redemption. Nail art is not included and charged separately.